The first destination in the Philippines was Tagaytay, a scenic locale about 55 km outside of Manila. With our flight arriving in Manila around 4:30AM, we struggled a bit to rouse ourselves but soon enough, our Filipino adventure was underway. Tagaytay was described as vacation spot of choice for people living in Manila that wanted to escape the city. A 1-2 hour drive from the city, Tagaytay is definitely much more rural, scenic, and calmer than the Filipino capital. The main attraction here was Taal Lake and the Taal Volcano, both of which you can see in the picture above. Our tour guide explained that it is the smallest volcano in the world surrounded by freshwater - seems like a pretty specific qualification but still very, very cool. We took a boat ride across the calm water as many of the fishermen were beginning to cast their lures. Our motley crew consisted of an American (me), an Englishman, a Scot, and a Czech (and we were later joined by two other Europeans - more on that in the next post). Upon arrival at the island, we mounted horses and rode up the mountainside. My horse, Jordan (named after the Chicago Bull superstar), took his time, but this gave me plenty of time to appreciate the scenery. Rocky, my guide, also taught me how to steer the horse, which was probably a poor decision on his part but we all survived. The above picture show us at the volcano. The lake on the interior was smoking in various places, and the ground was noticeably warm. Our guide explained that the volcano is actually a volcano within a volcano, though the outer volcano was no longer active. Thus, Taal Lake is actually a crater created from the original volcano. All volcanoes in the Philippines are part of the Ring of Fire that extends from Japan to California and to South America. Lunch was at Leslie's, a local establishment perched on top of the mainland mountain with a great view of the lake. Musicians roamed the restaurant, serenading the guests with either Filipino tunes or American Top 40 hits. We got Katy Perry. 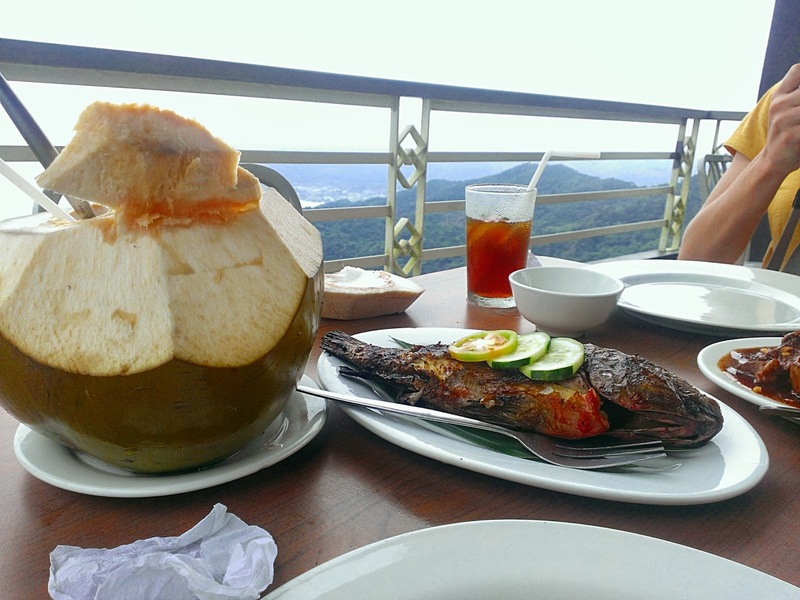 I had a grilled fish with a coconut, as seen the left. The coconut was an especially good decision - you get to drink the milk for your beverage and then scrape out the meat for dessert. The fish was quite tasty too, although it required a bit of work to remove the head and all of the bones from the meat. Garlic rice for the group was another victory, although my travel mates did not really enjoy their chicken adobo. I had recommended it because of its appearance on a Black Eyed Peas song; I though it tasted fine, but whatever. Overall, a delightful first day. Breathtaking scenery, great food, great company, couldn't ask for much more. However, our trip was interrupted by the typhoon the next day, which led to some unexpected experiences. Definitely! Tagaytay is a cool destination to visit in the province of Cavite, in the Philippines. I have visited this in my childhood with my uncle who is living in The Philippines. It is one of the most popular tourist destinations because it offers outstanding scenery and cooler climate. I wish to visit this beautiful city again after my bus tour to boston. Yeah! I agree with you. Tagaytay City is one of the best places to move in especially during summer. A lot of activities and I would suggest to a have sailboat experience once you get there.